Lexus LX570 (Landcruiser) vs. GMC Yukon/Escalade ESV? I'm a Yukon and LS430 driver so this is tough. IMO an LX will last longer and give you less problems.....but they're just invisible next to an Escalade. Escalade is just the king of the road in my eyes, it's an old design but IDK how the next one could possibly look any better. The Denali is the next best looking in my eyes. Whomever said the powertrains are a weak spot, um, an Escalade runs 0-60 in less than 6 seconds, sounding glorious as it does so. Crown jewel of an engine. 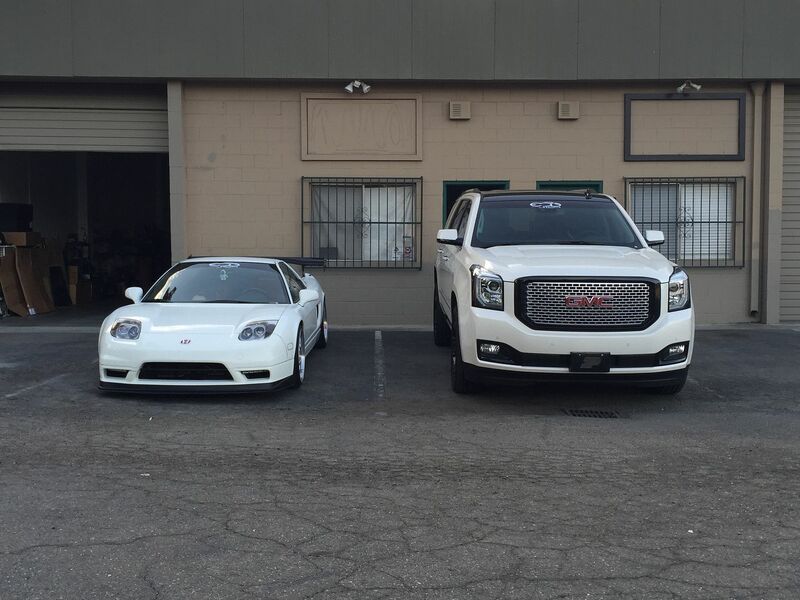 The 6.2 would be a big reason I would probably buy the GM truck. That's one of the most desirable motors on the planet IMO, especially since now moaning 4 cylinders are taking over. And I also just love the sheer presence the high end GM trucks possess. My 2003 Yukon has stupid things broken like the speedo and CD player, my seat heater, but it's solid as a rock mechanically. It's only 285hp, but I quite enjoy the engine. LS motors prove that pushrods work. It revs just as easily and happily as my DOHC V8 in my LS430. I can't even imagine flooring an Escalade or Denali, and the grin that would put on my face. The only reason we turned in the Denali was because it was a short wheel-base and we really wanted the longer one for more passenger / legroom / cargo space. I do agree GM lacks quite a bit and could learn from Lexus in terms of quality control and customer service. However I don't think the general GM customer base is the same as what Lexus is going for. People buy these trucks because of the power, capability and usefulness. The Lexus is not a "boutique" brand like Jaguar, Alfa, Lotus, etc however it's target demographics is probably at least one or two notches above GM's. The Caddy and Yukon Denali (aside from the Corvette) are really their only high end cars. Just my 2 cents....we recently picked up a new Escalade ESV and it's a behemoth and already in love with the truck. My wife's favorite feature is the front captain seats that have massage and kneading features for long road trips. The entire dash is wrapped in black Alcantara on the platinum model and has no less than 5 LCD TV's to entertain everyone with separate zones. We have it equipped with the tow package, Thule roof top box and and custom trailer hitch and it's the ultimate snow vehicle for our family since we are in Tahoe quite a bit. The LX is capable in snow but it's just too damn small for what we want to do. Now if Lexus came up with a true 8 passenger 3-row SUV with cargo space like an Extended Sequoia we may pay attention but otherwise it's not going to fill our needs. As luck would have it, I got a 2018 Suburban as a rental a few hours after replying to this thread. Already put 600 miles on it and will put another 200 to 300 miles on it before I turn it in- it rides very nice on the highway, is insanely big on the inside (my kids love it and called it a school bus) and certainly the size offers some advantages over the LX. Fit & finish is more industrial feeling and makes me think it competes better with the Sequoia which feels similar (I've been in Escalades and Denalis where interior fit & finish feels less industrial). Back-up camera quality is really poor IMO. Driving it around town reminds me of the big American cars from the 80's - it just kind of floats and sways around. The engine feels very familiar and similar to old GM products - so I think folks who are prior GM owners will feel right at home. Parking & maneuvering wasn't quite as bad as I remember and I was in some pretty tight areas in parking garages. One thing that's a total head scratcher- still a physical key (not push button) and no auto unlocking upon approaching the truck - I had to use the key fob. I imagine this is just a trim level option that my rental didn't have, but I can't believe a 2018 $60k vehicle doesn't have this (yet it has leather and a sunroof). On the TCO a LX570 is six figures, yes six figures, for years 1-5! Granted many of us might get something like that used. No... Or at least that's not how I would calculate and define TCO. The LX/Land Cruiser could only cost you six figures if you bought it brand new and literally never sold it or eventually gave it to someone for free. If you bought a new LX and spent $90k and kept it for 5 years, I'd estimate your TCO is somewhere in the range of $30k (ex: you sell it for $65k and spent $5k on maintenance & repairs). TCO by definition means how much did it cost you to operate something while you "owned" it. So it's really just the net difference of what you paid for something minus what you sold it for and what you put into it for the duration of your ownership. There are other tricks & loopholes associated with this (business use, write offs, etc) but in general I'm pointing out I disagree with how you are defining TCO. I understand what you are saying and do agree with you. That's why a Porschefile at a lauch told me that he's owned five 911s, and 2 were new, and that as far as he's concerned, even if you have the money, 5 y.o. is what he considers the sweet spot. My cousin is that way with a baby seat--his attitude is a baby seat has a 6 yr. life, and a nice one costs $300. If I'm only going to use it for 2 years, I am not paying $300. He might buy a 2 y.o. one , then sell it when it has 2 yrs. left. He only wants to pay for 2 yrs. at a depreciated rate. I think he's going too far but I get his thinking. I just paid the $300 and I do care about money. However, my buddy simply looks at LX570 and sees that no matter how one slices it, it costs far more than a Highlander, in every aspect. btw that's just a trim thing, the top level trim does not have to use the fob to unlock, nor to start. I guess I'm still baffled how any vehicle can have leather, sunroof, memory seats, heated seats (with a nice feature where just the back portion can be heated separately from the leg portion), lane assist, and NOT have push button start and the sensing tech to unlock the doors. Everything I just listed seems to be more expensive than the technology to have the smart key fob. And it seems you'd want to streamline production and make all Tahoes, Suburbans, Silverados, Yukons, Yukon XL, etc. just have push button and fob-sensing unlocking.. I digress..! GM in this regard is very similar to how Porsche builds their options into either extra cost items or as step up packages. Let me explain based on my experience. I had a rental Chevy Tahoe which is their based model car: Tahoe < Yukon < Escalade in that order. The car had pretty much an entire plastic molded dash, cheap seats, everything felt like it would in a Chevy base model. There was very very options but the car ran like a champ and did what it's supposed to. Tahoe has their upscale LTZ version which is their top of the line. You get creature comforts like leather, keyless entry, audio upgrades, etc but overall it still felt like a Chevy. I had a 2015 Yukon Denali on lease for 3 years and it was rock solid. It was slightly more money than the LTZ Tahoe but felt 10x nicer in terms of everything. Had extra leather bits, a much nicer exterior, motorized running boards, factory 22's and interior drop down LCD's among other things. This year we wanted to try an Escalade which is Chevy's top offering. Even in the Escalade they had various trim levels from base, Luxury, Premium Luxury, and finally Platinum which is the one we opted for because it was the only trim level to offer full black alcantara interior for dash, headliner, seat backs, glovebox, etc. The price swing was form $70k to over $100k for the Platinum. So my point here is GM knows very well how to separate their brand market shares to focus on each group. A typical Tahoe / Suburban buyer is probably not looking for the same features an Escalade would offer and vice versa. The GMC Yukon Denali slots in between for those who want luxury and also more practical outdoors type. Not sure if I got it right but this is how I feel about the 3 identical trucks from the same company under 3 different name brands. Way back when I first persuaded my dad to get his first Land Cruiser (a 94), and subsequent LX, and then a GX for my mom. The build quality and reliability was such a huge gap to other competitors, and the price difference wasn't super large if I remember correctly. We didn't need full Suburban size space. My uncle was a big Suburban fan, he bought a 97 and then an 07 Tahoe, both were super comfortable and he preferred the larger size. I think the GM trucks always had a light touch to the steering, which imparted an easy sense of driving (at least when moving forward). Flash forward to today, I have my dad in a Chrysler Pacifica and my mom in an Acadia Denali, went from total Toyota Motor Co garage to completely Detroit 3. The features, value, and drive were far superior to anything we looked at out of Japan for their needs. Knock on wood, both have been relatively painless in ownership needs so far. My dad just saw the LX and Land Cruiser and felt they were very heavy handed for their day to day needs. If we needed a full 3 row luxury ute, would probably wait for the new GLS-Class (looks promising based on the new GLE) or check out the X7 that's just coming out. Q7 is wonderful dynamically and technology wise, but the 3rd row is still a little tight and a bit cumbersome to get to regularly with the fold/tumble 2nd row seat (like the LC/LX). If anything Porsche is highly customizable and at least when I ordered mine it was not in packages, it was down to the minute detail, such as full or partial leather on visors, *****, dash, etc. I could have sworn that when we had a Suburban loaner it was a LT, and LTZ was the top of the line. I get that they call it something different today but the net net is the same. We seem to be talking about one vehicle uses a fob, another has push to start and is true keyless. Not that weird imho. The button is a gimmick, the not taking the fob out of a pocket or purse is not. As far as GM knowing something or anything well, we differ on that one. Good Lexus models w/AWD and already depreciated?